Bigfoot Discovery Day 2009, (Not) Your Typical Biscardi Movie, Texas Bigfoot Conference, New Blobsquatch Photo! 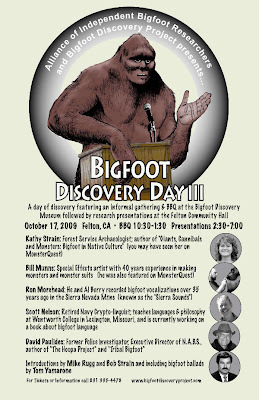 Coming soon to Felton, CA: Bigfoot Discovery Day III, 2009 mini-conference! This event is organized by Mike Rugg, of the Bigfoot Discovery Museum, just up Highway 9 from Santa Cruz, along with the Alliance of Independent Bigfoot Researchers. You'll be able to check out the amazing redwoods around that area (in Henry Cowell Redwoods or even better, Big Basin State Park) while you're at it--and yes, there have been reports of Sasquatch in the area. Kathy Strain: Forest Service Archaeologist and author of "Giants, Cannibals & Monsters: Bigfoot in Native Culture"
David Paulides: Former Police investigator, Executive Director of N.A.B.S., author of "The Hoopa Project" and "Tribal Bigfoot"
Bill Munns: Special Effects artist with 40 years experience in making monsters and monster suits (has also been on MonsterQuest)." It seems Bob Gimlin won't be coming to this one. He probably got enough bigfooting in for a while at the 9th Annual TEXAS BIGFOOT CONFERENCE, in Tyler, TX. Here are some links on that event, which we unfortunately missed (oh the life of a book shop owner! ), posted by Craig Woolheater of the TBRC: PHOTOS and an ARTICLE. And just out on DVD, here comes "NOT YOUR TYPICAL BIGFOOT MOVIE." 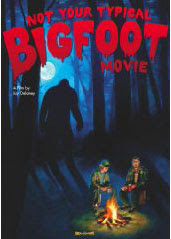 The film follows Mid-Western blobsquatchers Dallas and Wayne as they take photos of bushes and thickets, hoping to find some shape that looks vaguely like a Bigfoot in it, once they get home. They're working class guys on the rocks in hard times, and of course, they are trying to make some... money for their retirements. Enter Tom Biscardi. In the typical Biscardi modality, he flatters the hell out of them, and then swoops in and uses, burns, and abandons them. If you ever wondered how Biscardi works, just watch this film. It is truly disgusting. But the depiction of his "Bubba" victims is actually very sympathetic and humane. And yes, these guys do get out into the field searching, speaking some sort of Native American-styled spells into the woods, and spreading Reiki vibes everywhere, all the whilst contemplating suicide over their limited further prospects in life. It is playing free to subscribers to Netflix on a computer near you. And on another note, here is a new, amusing Bigfoot t-shirt design. Marketed by Threadless and drawn by Aled Lewis, it is called "Bigfoots Watch in Bewilderment," and is classic nerd-core fashion. Coming up on this blog! A very lengthy interview with the author of BIGFOOT: LIFE AND TIMES OF A LEGEND, Joshua Blu Buhs... that is, IF the discussion EVER ENDS! At this point it is over fifteen single-spaced pages long.